WHAT'S THE DEAL WITH MULCHES? 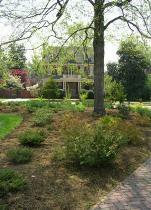 Mulches help reduce evaporation from the sun which then decreases the need for watering. Mulching also suppress weed growth naturally, lessening or eliminating the need for chemical herbicides. winter warm spells. Delivery and Installation are performed within professional guidelines! Light Landscaping, Trenching and Seasonal Firewood are also available. Please call for further info. Go to our MULCH Q&A PAGE for specific information and answers to many often asked questions. No Middlemen! Direct from our Fields to You! markets. Perfect Satisfaction is our Goal!